Unlike the testing of wave energy devices, which has been performed at laboratory scale since the late 1970s, the laboratory testing of scale model tidal current energy conversion devices is an embryonic activity. If it is to be reliable, then it is necessary to establish and assess guidelines to the effective testing of the performance tidal current energy systems. The underlying physical processes associated with tidal current energy conversion are covered by modern fluid dynamics. The importance of striving to achieve Froude and Reynold's similarity is known in all aspects of fluid model testing. In the testing of a tidal energy conversion system, there are additional complications. The nature of the depth velocity profile, sea bed shear effects, turbulent intensity, turbulent spectra, turbulent spatial correlation and free surface distortion are effects outside the scope of, for example, ship hull resistance and propulsion test, which are the basis of traditional towing tank tests. Indeed the basis for tow tank testing is the system under test is towed through essentially still water. A tidal current energy conversion system would be essentially still in moving water. The motion consisting of the tidal currents themselves and may be associated with wave activity. This flow is highly turbulent with high levels of geometries and flow conditions. It is important to consider drag in the presence of energy extraction as well as the influence of turbulence and shear on the energy extraction itself. It is known to be difficult accurately to achieve flow stability in large moving water channels, especially considering the technical problems associated with moving large volumes of water around. This study, which will draw upon and extend the work on testing guidelines in WP3, will examine the factors affecting the behaviour of tidal current systems and how they can be effectively modelled at tank scale. The limits of tow tank testing will be established and the requirements for water flow channels, in which a static device is exposed to moving water will be quantified. Typically such channels are smaller than tow tanks, which produces different problems to the system designer, who is attempting to assess a design in model tests. In addition to theoretical studies, parametric sensitivity studies, for the device concept families established in WP2, will be conducted in two different towing tanks, to establish the influence of different testing techniques and protocols. 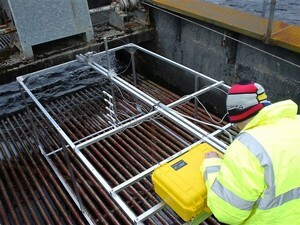 This will determine the effectiveness of towing sections of sea bed and turbulence inducing grids. These findings will also be compared to field studies in WP1. Finally, the boundaries to effective testing in towing tanks and in moving flow channels will be established and further guidelines established. Establish the operational limits to effective scale model testing. Forces on objects towed through still water differ from those on objects in moving water, as a result of physical properties such as turbulence and flow shear. The aim of work package 11 was to quantify these differences with respect to tidal current devices and to use this understanding to guide future testing. The work had two parallel modes: numerical and physical. The numerical study has provided understanding of the parameters influencing system performance and has governed the design of the experimental programme. The commercial CFD package, 'Fluent', was used for numerical simulations. A tidal turbine was approximated by a porous disk and the extraction of energy was simulated as a momentum sink. The model was used to generate a sensitivity analysis, demonstrating that turbulence does influence the loading on the energy extraction system, the form of the wake behind the device and pressure/flow distortion around the energy extraction zone. Findings from the numerical programme guided the design of a "flexible" test system, which was used in a moving water environment that formed part of the outflow works of a hydroelectric power station. A series of tests provided results in excellent agreement with those of the numerical studies. The test rig was built and used for a complementary series of tests in a towing tank. This ultimately proved the hypothesis that there are measurable differences between physical tests conducted in moving water and still water resulting from propagation and transmission of the pressure gradient field and turbulence influences. It has now, however, been shown that the influence of flow profile can be effectively handled by data post processing. This work has demonstrated the difference between measured forces on tidal device components fixed in flowing water compared to being towed in still water, and identified means of resolving that difference.